On Saturday 24th November, by son's dream came true. 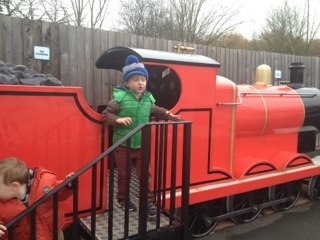 We were invited to the Drayton Manor/Thomas Land press day! Even though we knew it would be freezing, we set off straight from work on the Friday night in fine spirits, safe in the knowledge that we would soon be at one of our all time family favourite days out! We arrived at the hotel late on Friday with two VERY tired boys. We knew there wasn't a cat in hells chance that we would get a Thomas room, but the room we stayed in was absolutely lovely. The hotel itself was really quiet, though there was Thomas plaques everywhere, a toy shop (mercifully shut at that time) and a carousel in the middle of the room that little fingers could switch on at the touch of a button. The boys luckily went to sleep ok in lovely comfy beds, and we woke up refreshed the next day though a little disappointed at the weather. 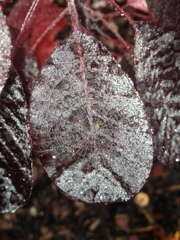 You can see how cold it was by looking at this beautiful leaf with a spiders web etched on it. We really enjoyed breakfast and toyed with paying the upgrade to have breakfast with the fat controller. However my son is actually a bit terrified of the fat controller and wept when we mentiond it, so we decided to not waste our money if it would just end up with tears and tantrums. There is a little train that runs from the hotel to Thomas Land, though we didn't bother with it as we had quite a lot of time to spare - the park didn't actually open until midday and we had to check out at 10am so there was a bit of time to kill which was a bit annoying as there wasn't really anything to do. Anyway, we had a walk, then started queueing to get in. Most people seemed to have either Tesco Voucher tickets etc to get in, and actually once the gates opened it was quite quick to get in. We were given a time to see Santa, which seemed like a good idea, and joined the queue which moved really quickly. The staff were very authentic and our Santa was wonderful, just right and said all the right things to make the experience magical for my boys. Unfortunately it started raining fairly heavily very soon after we got there. What this did mean though was that there was hardly any queue for the rides! 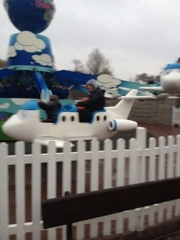 Unlike Disneyland Paris, which we went to a few weeks before, and were queueing up to 2 hours per ride, we were able to go on any ride we wanted straight away! Sweet! 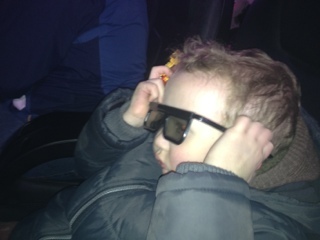 As part of the press day we were invited to a private screening of a 4D version of the Polar Express. We've seen the film many times, and in 3D too, but the 4D version was cool; there was fake snow, bubbles, water sprayed in our faces, it was amazing. It's definitely a film to be seen on the big screen. After the 4D showing, there were fireworks and other such things, but I'm afraid we were just too wet so we went home. We were treated to goody bags which the boys loved and the press staff did a great job of making us feel special. We were invited to Thomas and as part of the press day and were given a free nights accommodation in the hotel, but all thoughts are my own.